Champagne is a sparkling wine produced in the Champagne region of France under the rules of appellation. The name Champagne is legally protected. However, some use this term as a generic term for sparkling wines. 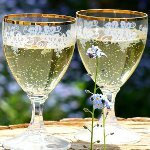 As Champagne can be quite expensive and hard to find, you can celebrate the National Champagne Day drinking any sparkling wine you like, no matter whether it comes from France, Italy, or California. Buy several bottles of sparkling wine as gifts to your family and friends and don't forget to make the annual New Year's toast at midnight. What food can sparkling wine be paired with? It goes well with cheese, seafood, strawberries, and light desserts. Instead of drinking pure Champagne, you can make various cocktails that will be perfect for New Year's Eve. For instance, Mimosa is a classic Champagne cocktail. To make this cocktail, you will need 4 ounces of Brut champagne and 2 ounces of fresh-squeezed orange juice. First pour the juice into a champagne flute and then top up with champagne. You can also add a teaspoon of Grand Marnier.